In 597 AD, Pope Gregory the Great saw beautiful Angle slaves in Rome and decided their people would benefit from learning more about Christianity. 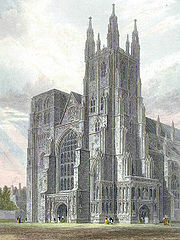 He sent Saint Augustine to England where King Ethelbert and his Christian Queen Bertha, gave him a church at Canterbury. There had been a place of worship at Canterbury since the Roman occupation of England. Augustine was the first Archbishop of Canterbury and he built the first cathedral. In the tenth century, Canterbury became a confirmed Benedictine community which lasted until the Dissolution of the Monasteries under King Henry VIII in the sixteenth century. The original building was extensively rebuilt by the Saxons and completely rebuilt by the Normans in 1070 after a considerable fire. Parts of the choir and some of the stained glass still exist from the twelfth century. The most significant event to occur in Canterbury Cathedral is the death of Thomas Becket in 1170. King Henry II had made his good friend Thomas Archbishop of Canterbury in 1162, thinking he would do his bidding without answering to the Pope. Much to Henry’s chagrin, Thomas adhered to his allegiance to the Pope and meddled in Henry’s affairs as King. One night, in a moment of great frustration, Henry uttered these words in front of some of his knights: “Who will rid me of this meddlesome priest?” The knights believed Henry wanted Becket killed. They rode to Canterbury and murdered Becket at the altar in the North West Transept during vespers. Three days after Becket’s murder, miracles began to occur. These miracles are depicted in the stained glass windows of the Trinity Chapel. Becket was canonized in 1173. Many people have made a trip of pilgrimage to Canterbury Cathedral to visit Thomas Becket’s shrine, much like the pilgrims in the “The Canterbury Tales” of Geoffrey Chaucer. 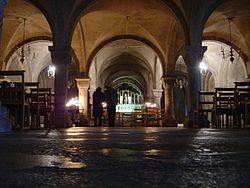 Unfortunately the original shrine to St. Thomas was destroyed in the sixteenth century but many people still visit the cathedral to this day. You’re welcome Princess. Arran is a good guy! Thanks for your kind comments. I’m sure you are right about the confrontation between Henry and Thomas. What ever was said, Henry was probably in one of his great Plantagenet rages and it wasn’t good for Thomas! Hi Susan, thanks for another terrific piece, just recently discovered your blog, & also the blog you co-write with your friend Susan, I think both are super, & am rapidly becoming something of an addict. Great to find other people who are passionate about history & in writing about it in order to share it. As your posts are excellent you might welcome a small clarification on the Thomas Beckett v Henry II confrontation, offered with great trepidation and respect. I understand that the Norman knights who took Henry’s words so literally actually visited the Cathedral a first time, the previous night, to try and force Tomas to leave with them (and go to Henry, then in Normandy). When he refused, they returned the following morning, tried again, and when he refused again to leave, they then attacked and slew him. As for the famous words, attributed to Henry- “Who shall rid me of this troublesome/meddlesome priest? !” well, it’s hard now to know of course, but many today believe these words to be apocryphal. Henry may instead have said… “What miserable drones and traitors have I nourished and promoted in my household, who let their lord be treated with such shameful contempt by a low-born clerk!” Still great language, no? full of full-blooded medieval rage and vigour. Anyway, great post, keep up the super work. – Arran.